Everyone knows what my favorite pizza topping is - MORE PIZZA! Michael's Pizza Bar is tucked away on 26th and Sarah Street towards the Southside Slopes. Although the food and drinks are very cheap, the place is definitely not a dive bar. The interior is very nice and well decorated, you can't smoke inside and it is entirely acceptable to bring your children in to eat. Be warned though, seating is limited so it isn't necessarily great for large groups. Here are my rankings for non-specialty Southside pizza: 1) Michael's - 2) Grotto - 3) Pizza Sola - 4) Genaro's - 5) CoGo's gas station - 6) Sal's - 7) Domino's - 8) Pizza Hut. Please keep in mind that I stated non-specialty pizzas so several places with wonderful pizza such as Winghart's, Local and the Blind Pig are all excluded. Although Michael's easily topped my list, if you take price into consideration I think they are an even bigger winner. A slice at places such as Grotto or Pizza Sola can easily run you upwards of five dollars. However, for Michael's pizza special on Thursdays a slice of pizza is only eighty cents!! I gave Michael's the top spot because I think their pizza has a very nice crust along with well proportioned and well seasoned toppings. I've had slices of pizza from both Pizza Sola and Grotto that were better than Michael's, but I give Michael's first place for consistency. (I want to give Grotto special accolades for allowing me to take a huge box of pizza they were about to throw away one night about a year ago.) The quality of the pizza at many locations in the Southside can vary greatly depending on the current staff and the seasonal/hourly customer demand for pizza induced sobriety. However, Michael's caters to the neighborhood crowd rather than the bar-goers and maintains a more consistent quality level. Because I don't get to Michael's very often, I wanted to try something else from their extensive menu. 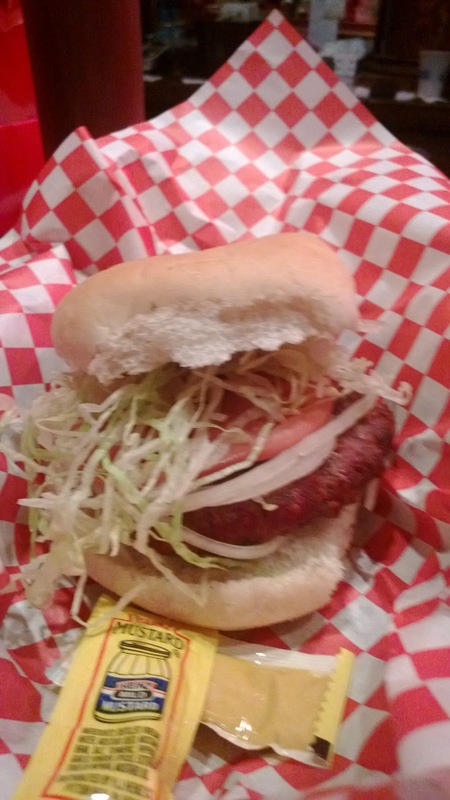 This is the plain burger from Michael's and it wasn't bad. I thought the meat patty was a little wimpy and I would have liked a bit more seasoning. There are probably about twenty-five hamburgers in the Southside that I'd choose over this one. However, considering that you can get one of these burgers for only a dollar on Mondays, I'm not sure there is much room for complaint. If you have to pick between burger night or pizza night, I'd certainly opt for pizza night.